Having achieved great success with original animated sitcoms like BoJack Horseman and Big Mouth, it appears that Netflix is onto another winner with Disenchantment, the new series from The Simpsons and Futurama creator, Matt Groening, which now has its first trailer. Announced last month, the show is set in the medieval kingdom of Dreamland and follows the misadventures of "hard-drinking young princess Bean, her feisty elf companion Elfo, and her personal demon Luci." The trio will be voiced by Abbi Jacobson (Broad City), Nat Faxon (Club Dread) and Eric Andre (Robot Chicken), and you can also expect voice work from Groening regulars such as John DiMaggio and Billy West from Futurama, along with Matt Berry, Rich Fulcher and Noel Fielding of The Mighty Boosh fame. The trailer, which is short and sweet, focuses on Groening's past accomplishments before whisking us off to Dreamland to show an especially awkward moment between Bean and the king. 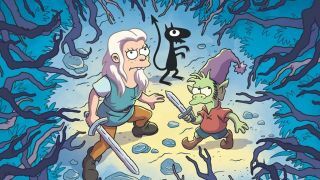 Thankfully, we won't have to wait much longer to see more, with the first ten episodes of Disenchantment landing on Netflix on August 17, 2018. In the meantime, you can check out the trailer below.